This is basically as the organ now is, though the Stopped Diapason is on the stop label as a Lieblich Gedact (a type of stop Charles Brindley took over from his mentor, Edmond Schulze, the celebrated German builder). There are pilot holes in the Swell rackboard for an extra stop, perhaps showing that Brindley made standard parts rather than that this was a prepared-for stop. In 1894 a new organ chamber-vestry was built. Before this date, the organ must have been in the SW (or opposite) corner, since the case panelling and impost moulding are on the treble side only. 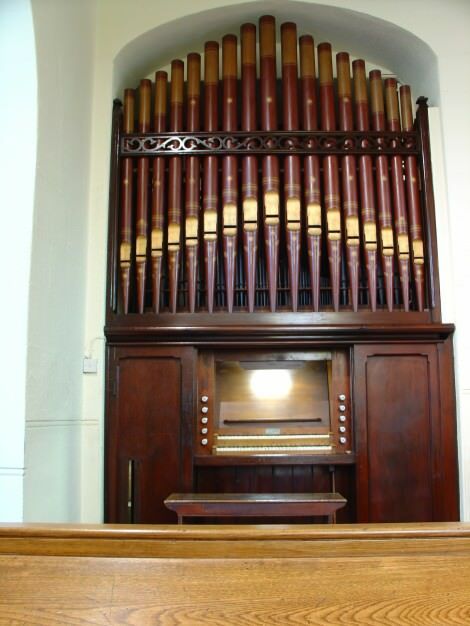 Brindley and Foster added a stopped bass to the Swell, outside the organ on the treble side. Otherwise the organ may be entirely unaltered since 1865. The organ project was fostered by Sue Broomhead, the organist of the church, who raised much of the money through the A4A Lottery funding in 2004.